Library Salary Surveys available in print or database! Order Now! Subscribe to the Library Salary Database – ALL 2009-present Librarian and Non-MLS Data is included. Access current data for six Librarian and more than 60 Non-MLS titles by state, region and library type. Subscriptions are $50 for 30-day access and $150 ($250 for non-ALA members) for access for one year. The data is also available in a print publication for $90. For more information contact the American Library Association’s Store. (or Dial 866-746-7252). For discussion of past years’ data, see the Salary Survey summaries and fact sheets. The American Library Association-Allied Professional Association (ALA-APA) has just released two new downloadable versions of the 2009 edition of the “ALA-APA Salary Survey: Librarian – Public and Academic.” One version contains only public librarian salary data and analysis and the other version is specifically for academic librarians. The “ALA-APA Salary Survey: Librarian – Public”and “ALA-APA Salary Survey: Librarian – Academic” are available at the American Library Association (ALA) online store. For $36, library administrators, human resources specialists and librarians can view and print data for six librarian titles by region and state. The public library version includes salary data by five library sizes, from those serving populations below 10,000 to more than 500,000. The academic library version includes salary data by library type (two-year, four-year, university) for academic libraries. CHICAGO – Results from the 2009 edition of the “ALA-APA Salary Survey: Librarian – Public and Academic” are available in two ways – immediately for subscribers to the ALA-APA Library Salary Database and in print from the American Library Association (ALA) online store. Analysis of data from more than 1,179 public and academic libraries showed the mean salary for librarians with ALA-accredited master’s degrees reported decreased less than 1 percent from 2008, down $100 to $58,860. The median ALA MLS salary was $54,500, 2 percent higher than in 2008, and salaries ranged from $22,000 to $256,800. ALA-APA thanks all the library staff who completed the survey on behalf of their institutions and state data coordinators and ALA state chapter Councilors who alerted libraries. Published by the American Library Association-Allied Professional Association (ALA-APA) in cooperation with the ALA Office for Research and Statistics, the survey shows aggregated data from more than 17,018 (a 5 percent increase over 2008) individual salaries of ALA MLS librarians. The six librarian positions are directors/deans, associate/assistant directors, department heads, managers of support staff, librarians who do not supervise and beginning librarians. The 2009 response rate of libraries participating was 33 percent, an improvement of four points over 2008. Almost 3,600 libraries were in the sample asked to respond. Responding libraries this year received a 30-day subscription to the “Library Salary Database” and a 25-percent discount off the print edition. The “Library Salary Database” includes data from 2006 to the present for more than 60 librarian and non-MLS positions, which can be searched by state, eight library types and four regions. The survey gives national-level mean and quartile data. The printed reports include analysis of salary trends and an extensive appendix of other sources of compensation data within and outside of the library profession. The “Librarian Salary Survey” continues more than 25 years of collecting and reporting salary data for six positions requiring an ALA-accredited master’s degree in library science. The survey was completed with consultation from Denise M. Davis, director of the ALA Office for Research and Statistics and conducted by The Management Association of Illinois. 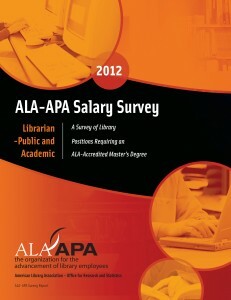 Libraries may purchase the “ALA-APA Salary Survey: Librarian – Public and Academic” from the ALA Store at $81 for ALA members/$90 for non-members. Database users may subscribe by using this form. Print purchasers may order through the ALA Store at http://www.alastore.ala.org/. The American Library Association-Allied Professional Association: the Organization for the Advancement of Library Employees is a service organization to the American Library Association and has as one of its missions supporting salary improvement initiatives for library workers. Please contact the ALA-APA Office at (800) 545-2433, ext. 2424 or jgrady@ala.org with questions or comments. CHICAGO – Results from the 2008 edition of the ALA-APA Salary Survey: Librarian – Public and Academic are available in two ways – immediately for subscribers to the ALA-APA Library Salary Database and in print from the American Library Association (ALA) online store. Analysis of data from more than 1,010 public and academic libraries showed the mean salary for librarians with ALA-accredited Master’s Degrees reported increased 2 percent from 2007, up $1,151 to $57,809. The median ALA MLS salary was $53,251 and salaries ranged from $22,000 to $331,200. ALA-APA thanks all the library staff who completed the survey on behalf of their institutions. Published by the American Library Association-Allied Professional Association (ALA-APA) in cooperation with the ALA Office for Research and Statistics, the survey shows aggregated data from more than 16,259 individual salaries of ALA MLS librarians. The six librarian positions are directors/deans, associate/assistant directors, department heads, managers of support staff, librarians who do not supervise and beginning librarians. The 2008 response rate, with 1010 libraries participating, was 29 percent, an improvement of five points over 2007. More than 3,400 were in the sample asked to respond. In 2007, 834 libraries responded to the Librarian and Non-MLS Salary Surveys. Responding libraries this year received a 30-day subscription to the Library Salary Database and a 25 percent discount off the print edition. The Library Salary Database includes data from 2006 to the present for more than 60 librarian and non-MLS positions, which can be searched by state, 8 library types and four regions. The survey gives national-level mean and quartile data. The printed reports include analysis of salary trends and an extensive appendix of other sources of compensation data within and outside of the library profession. The Librarian Salary Survey continues more than 20 years of collecting and reporting salary data for six positions requiring an ALA-accredited master’s degree in library science. The survey was completed with consultation from Denise M. Davis, director of the ALA Office for Research and Statistics, and conducted by The Management Association of Illinois. Libraries may purchase the ALA-APA Salary Survey: Librarian – Public and Academic from the ALA Store at $81 for ALA members/$90 for non-members. Database users may subscribe online at http://cs.ala.org/websurvey/salarysurvey/salarysurveyform/form.cfm. Print purchasers may order through the ALA Store at http://www.alastore.ala.org/. The American Library Association-Allied Professional Association: the Organization for the Advancement of Library Employees is a service organization to the American Library Association and has as one of its missions supporting salary improvement initiatives for library workers. Please contact the ALA-APA Office at 800-545-2433, x2424 or jgrady@ala.org with questions or comments. CHICAGO – Results from the 2007 edition of the ALA-APA Salary Survey: Librarian – Public and Academic and ALA-APA Salary Survey: Non-MLS – Public and Academic are now available in two ways – immediately for subscribers to the ALA-APA Library Salary Database and in print in August from the American Library Association (ALA) online store. Analysis of data from more than 800 public and academic libraries showed the mean salary for librarians with ALA-accredited Master’s Degrees reported increased 2.8 percent from 2006, up $1,550 to $57,809. The median ALA MLS salary was $53,000. Salaries ranged from $22,048 to $225,000. For the first time, the Non-MLS Salary Survey data, including sixty-two Non-MLS positions, reports salaries for staff employed as librarians but who do not have ALA-accredited Master’s Degrees in Library Science. Non-MLS salaries ranged $10,712 to $143,700. Both printed surveys also indicate the minimal educational requirement for each position. The Librarian Salary Survey continues more than 20 years of collecting and reporting salary data for six positions requiring an ALA-accredited master’s degree in library science. The Non-MLS Salary Survey has been published since 2006. “The Librarian Salary Survey” price remains unchanged at $63 for ALA members/$70 for non-members. Participating libraries receive a 25 percent discount. “The Non-MLS Salary Survey” is $90 for ALA members/$100 for non-members and participating libraries receive a 25 percent discount. Database users may subscribe online at http://cs.ala.org/websurvey/salarysurvey/salarysurveyform/form.cfm. Print purchasers may order through the ALA Store at http://www.alastore.ala.org/. Both surveys were completed with consultation from Denise Davis, director of the ALA Office for Research and Statistics, and conducted by The Management Association of Illinois. CHICAGO – Library Directors and Human Resources staff – Check your mail! 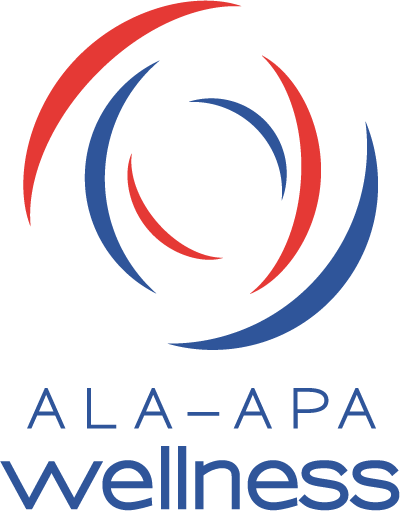 Almost four thousand public and academic libraries are being asked to participate in the 2007 ALA-APA Library Salary Survey. This year, the Librarian and Non-MLS Salary Surveys are combined. The deadline is Friday, March 30, 2007, for completing the Web-based survey. Letters will sent out this week and be addressed to the attention of the Library Director or Human Resources Manager, in envelopes with the ALA-APA logo. The public and academic libraries that receive the letter are part of a scientifically selected sample, chosen to reflect the variety of sizes of libraries as well as to ensure that the sample will be statistically significant for state salary data reporting. It is very important that all who are asked to participate respond so that the surveys provide the highest quality information to managers who set and benchmark salaries and for library employees who are in the process of evaluating their career prospects. Participants receive a discount on the printed version. Changes were made to the survey based on feedback from 2006. There will only be one survey this year, which includes both MLS and Non-MLS positions. Full-time and part-time salaries are requested, as well as how your institution defines full-time. There are 68 positions, and for several, you may specify departments (or functional area). For some positions, you may report MLS as well as non-MLS staff with similar responsibilities, e.g., Director (MLS) and Director (non-MLS). Positions were redefined, added and removed from 2006. Finally, no supplemental questions are included in 2007 because we respect that completion of this survey is a substantial task for many of you. ALA has collected and published salary information on librarians with ALA-accredited masters degrees since 1982. ALA-APA continues to consult with the ALA Office for Research and Statistics to conduct the survey. In 2005, that survey was expanded to address the request by the library community to have state-level data. In 2006, we conducted the first annual non-Masters degree in Library Science (non-MLS) Salary Survey. ALA-APA will soon launch the Library Salary Database with salaries from 68 librarian and non-MLS positions. Users may choose reports for each position by library type, state and/or region. There is a trial version of the database at http://cs.ala.org/websurvey/salarysurvey/trial/index.cfm. There will be a special rate of $30 offered for the next few months for a one-month subscription to the database, which will have 30-day and annual subscription options. If you have any questions, please contact the ALA-APA Office at 800-545-2433, x2424 or jgrady@ala.org. CHICAGO – The 2006 edition of the “ALA-APA Salary Survey: Librarian – Public and Academic” (previously known as “Librarian Salary Survey”) is available for purchase from the American Library Association (ALA) online store . With data from more than 1,000 public and academic libraries, the mean salary reported increased 4.6 percent from 2005, up $2,480 in 2006. Published by the American Library Association-Allied Professional Association (ALA-APA), the survey shows aggregated data from more than 10,000 individual salaries at the state and regional levels. Positions included are directors/deans, associate/assistant directors, department heads, managers of support staff, librarians who do not supervise and beginning librarians. The survey gives national-level mean and quartile data. The report includes analysis of salary trends and an extensive appendix of other sources of compensation data within and outside of the library profession. The median salary was $50,976. Salaries ranged from $22,000 to $253,500. This survey continues more than 20 years of collecting and reporting salary data for six positions requiring an ALA-accredited master’s degree in library science. It complements the new “ALA-APA Salary Survey: Non-MLS – Public and Academic,” which presents data from 62 positions that do not require an MLS. The “Non-MLS Salary Survey” also indicates the minimal educational requirement for each position. Quick facts about the “Non-MLS Salary Survey” are found on the ALA-APA Web site: http://www.ala-apa.org/salaries/nonmlssurveyfacts.html . The “Librarian Salary Survey” price remains unchanged at $63 for ALA members/$70 for non-members. Participating libraries receive a 25 percent discount. The “Non-MLS Salary Survey” is $90 for ALA members/$100 for non-members, and participating libraries receive a 25 percent discount. CHICAGO – The first edition of the ALA-Allied Professional Association (ALA-APA) Non-MLS Salary Survey will be available in late August. This is the first survey to collect information on a large number of the positions within libraries that do not require an MLS degree from an ALA-accredited institution. This study is a companion report to the annual ALA-APA Survey of Librarian Salaries published by the ALA-APA and the American Library Association Office for Research and Statistics (ORS). The study, available at the end of August, will report data on 62 different positions such as associate librarians, library technical assistants, copy catalogers and interlibrary loan assistants, information technology managers, human resources managers, administrative assistants, accountants, and development personnel. The annual salaries reported range from $10,712 to $141,924. In keeping with the Survey of Librarian Salaries, public and academic library results are split into smaller categories for analysis. The public libraries are separated into five categories based upon the size of the population served, very small to very large. The academic libraries examined in the survey are divided into two-year colleges, four-year colleges, universities, and members of the Association of Research Libraries (ARL). The survey presents regional and state-level mean, quartile, and range data on all 62 positions across all nine categories of libraries. The census regions are: North Atlantic, Southeast, Great Lakes & Plains, and West & Southwest. Survey methodology, technical considerations and detailed discussion are also provided. The ALA Non-MLS Salary Survey will be $90 for institutional and individual ALA members and $100 for non-ALA members. It may be purchased from the ALA online store, www.alastore.ala.org. The 2006 Survey of Librarian Salaries will be $63 for institutional and individual ALA members and $70 for non-ALA members. The research team was led by ALA-APA Director Jenifer Grady and ORS Director Denise Davis. The survey was conducted and analyzed by the Management Association of Illinois, led by Kristy Williams, CCP, Manager of Compensation Services. The team thanks all of the 839 libraries that took part in this inaugural survey.